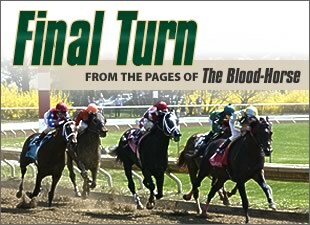 The “Final Turn” was introduced in the July 4, 1992, issue with a piece by Steven Crist, now publisher and columnist for the Daily Racing Form. In 1992 Crist covered New York racing for The Blood-Horse. He wrote about the “Hero Myth,” the belief that a superhorse or a Triple Crown winner will come along and save racing. The subjects of the “Final Turn” have covered a broad spectrum—a lot of prescriptions for fixing racing and even advice for breeders about dealing with international competition. We have had many great remembrances, too, such as one from Sean Clancy about an estate sale he attended for the late Hall of Fame trainer Sidney Watters Jr. The piece on Watters won the Eclipse Award for news/commentary writing in 2009. Most pieces submitted for the “Final Turn” have challenged us or called us to action. Innovative ideas are essential, so we want everyone with an interest in and a passion for Thoroughbred racing to continue submitting thoughtful and provocative opinions. These will be published regularly on the “Industry Voices” blog, one of our editorial outlets on BloodHorse.com started in May 2010. The best of what is submitted will run in the magazine on a page following “The Wire” news section in addition to appearing online. What will appear on this page beginning in the March 26 issue is a new feature called “Winner’s Circle.” Here you will learn more about the owners and breeders whose substantial investments in time, money, and effort make the Thoroughbred industry work. These one-page features will give you insight into who these people are, how they became involved and enraptured with Thoroughbred racing, and what has brought them success. These stories also will be posted on BloodHorse.com in a new “Winner’s Circle” blog, where readers are welcome not only to post comments and observations but submit their own suggestions for the subjects of future stories. Because the industry has so many interesting tales, we’ll slip in a couple of features now and again about extraordinarily successful broodmares, a new trainer that is catching fire, or a racehorse with a compelling story that may not be a graded stakes winner but is finding success at other levels of the game. We want to hear suggestions on these subjects, too. For our first “Winner’s Circle” feature you’ll learn more about John D. Gunther, the co-breeder of Triple Crown hopeful Stay Thirsty, whom he bred with his son, John Darren Gunther. Later we’ll visit with George Bolton, co-owner of The Factor, who won the San Vicente Stakes (gr. II) and is headed for the March 19 Rebel Stakes (gr. II). In the “Winner’s Circle,” you’ll learn more about the people who share your passion for Thoroughbred racing, and you might pick up some tips that could lead to your own success story. Whether it is making connections or sharing ideas, The Blood-Horse is here for you and wants to hear from you. Visit the Winner's Circle by clicking here.